Posada started the 2002 MLB All-Star Game. He batted .268 with 20 home runs and 99 RBIs, and grounded into an AL-leading 23 double plays. He again led all catchers in errors. The Yankees entered the postseason again but lost in the 2002 ALDS to the Anaheim Angels. Posada won a Silver Slugger Award for a third consecutive season. In 2004, Posada committed 24 double plays, which led the American League, but batted .272 with 21 home runs and 81 RBIs. After defeating the Minnesota Twins in the 2004 ALDS, the Yankees lost to the Boston Red Sox in the 2004 ALCS despite leading the series three games to none. In 2005, Posada batted .262 with 19 home runs and 71 RBIs. The Yankees reached the postseason again, but lost to the Los Angeles Angels of Anaheim in the 2005 ALDS. In 2006, Posada posted his highest batting average and home run total since 2003. He also led the major leagues with 20 pinch hits. In addition, work with new first base coach Tony Peña, a former catcher, helped him improve his percentage of runners thrown out stealing second almost 60 points above his career average. However, he again led the league in passed balls. He batted .277 and had 23 home runs with 93 RBIs. On May 16, Posada led the Yankees to a victory despite falling behind by nine runs, matching the largest deficit the Yankees overcame for a victory in franchise history. He registered a +0.93 win probability added in that game, the highest of his career. Posada hit the first regular-season home run in the new Yankee Stadium on April 16, 2009, against Cliff Lee of the Cleveland Indians. During a game against the Toronto Blue Jays on September 15, 2009, Posada took exception to a pitch that was thrown behind him by Jesse Carlson. Posada walked and later scored on an RBI single by Brett Gardner. After Posada crossed home plate, he bumped into Carlson and was then ejected after taunting Carlson. Posada then charged at Carlson igniting a bench-clearing brawl. Posada and Carlson were each suspended three games by the MLB for their roles in the brawl. Posada finished the 2009 season with a .285 batting average, 22 home runs, and 81 RBIs. During the 2009 postseason, Posada had a .276 batting average and 2 home runs. The Yankees won the 2009 World Series against the Philadelphia Phillies. In an interleague series against the Houston Astros in June 2010, Posada became the first Yankee since Bill Dickey in 1937 to hit a grand slam in back-to-back games. On July 23, 2010, Posada recorded his 1,000th career RBI against the Kansas City Royals. 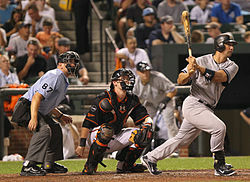 Posada finished the 2010 year batting .248 with 18 home runs and 57 RBIs. The Yankees went into the postseason again but lost to the Texas Rangers in the 2010 ALCS. 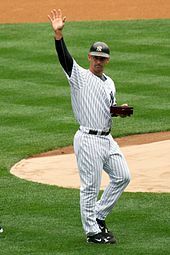 When asked by reporters after the 2011 ALDS if he had considered that he might have played for the final time with the Yankees, Posada said, "I don't want to look at it like that. We lost, and we'll see what happens in the off-season." As the interview session went on, he eventually became emotional and left the clubhouse area to compose himself. Girardi said, "This guy, when you look at what he did in this series, he was awesome. He's had a tremendous career, and I'm sure he's going to continue to play, and I don't know what's going to happen." Girardi added, "But you talk about being proud of players — what he went through this year and what he gave us in the postseason, I don't think there's a prouder moment that I've had of Jorge." Posada wrote a children's book entitled Play Ball! that was published in 2006. He and his wife co-wrote Fit Home Team, a family health manual, and an autobiography titled The Beauty of Love: A Memoir of Miracles, Hope, and Healing, which describes their personal ordeals and how they dealt with them after learning of their son's birth condition in 1999. In 2014, Posada along with José Contreras filed a lawsuit against their former financial advisors Juan Carlos Collar and Anthony Fernandez, alleging that they were scammed out of millions due to questionable investments and inside-dealing. Posada, Jorge; Colon, Raul; Burleigh, Robert (2006). Play Ball!. Simon & SchusterPaula Wiseman Books. ISBN 978-1-4169-0687-2. ^ Marchand, Andrew (January 24, 2012). "Yankees' Jorge Posada retires". ESPN.com. Retrieved January 24, 2012. ^ a b "Jorge Posada Statistics and History". Baseball-Reference.com. Retrieved August 8, 2012. ^ a b c d e f g h i j Sanchez, Jesse (June 29, 2004). "Devoted on and off the field". MLB.com. Mlb.mlb.com. Retrieved August 8, 2012. ^ "Jorge Posada Biography". Jorge Posada. Retrieved 28 April 2014. ^ a b c d e f g h i Verducci, Tom (May 7, 2001). "The Posada Adventure: How Jorge Posada went from a too slow infielder to a starring role behind the plate for the Yankees". Sports Illustrated. Retrieved August 8, 2012. ^ "Sweet home Alabama". The LoHud Yankees Blog. The Journal News. July 1, 2009. Retrieved September 12, 2010. ^ a b c Red, Christian (September 6, 2009). "Yankees catcher Jorge Posada adds to legacy on field with foundation to fight craniosynostosis". New York Daily News. Retrieved November 14, 2011. ^ Vinton, Nathaniel (March 27, 2010). "Modern Yankees Heroes: Jorge Posada caught on with bat and work ethic". New York Daily News. Retrieved August 8, 2012. ^ Taube, Aaron (August 25, 2011). "Yankees share a laugh with Jorge Posada back at second base". MLB.com. Retrieved October 17, 2011. ^ a b c d e f Ghiroli, Brittany. "Path of the Pros: Pettitte, Posada | MiLB.com News | The Official Site of Minor League Baseball". Milb.com. Retrieved September 20, 2013. ^ Curry, Jack (December 5, 1995). "BASEBALL;Yanks' Martinez Trade Talks Stall". The New York Times. Retrieved September 24, 2013. ^ Chass, Murray (December 27, 1995). "PRO BASEBALL;The Rich Get Richer As Orioles Get Wells". New York Times. Retrieved September 24, 2013. ^ a b c Jaffe, Chris (January 9, 2012). "Jorge Posada: Career Highlights". The Hardball Times. Retrieved January 10, 2012. ^ "1995 League Division Series – Seattle Mariners over New York Yankees (3-2)". Baseball-Reference.com. Retrieved September 20, 2013. ^ "1996 World Series – New York Yankees over Atlanta Braves (4-2)". Baseball-Reference.com. Retrieved September 20, 2013. ^ a b Curry, Jack (March 27, 1997). "Girardi Gets Turn To Play Big Brother". The New York Times. Retrieved November 14, 2011. ^ a b c Curry, Jack (January 28, 1998). "Baseball; Posada Wants Career to Enter Present Tense". The New York Times. Retrieved November 14, 2011. ^ Kepner, Tyler (March 2, 2008). "Now Batting, the Best Deal the Yankees Never Made". The New York Times. Retrieved August 15, 2012. ^ Botte, Peter (May 18, 1998). "All The Pieces Of A Perfect Puzzle". New York Daily News. Retrieved November 14, 2011. ^ a b Curry, Jack (March 3, 1999). "BASEBALL; Raise Leaves a Bitter Taste With Posada". The New York Times. Retrieved November 14, 2011. ^ "1998 World Series – New York Yankees over San Diego Padres (4-0)". Baseball-Reference.com. Retrieved September 20, 2013. ^ Olney, Buster (February 13, 2000). "Baseball: Heavy Burdens Behind the Plate; Catching for the Yanks: It's Jorge Posada's Job". The New York Times. Retrieved November 14, 2011. ^ Botte, Peter (October 28, 1999). "Jorge Catches Joe's Attention". New York Daily News. Retrieved November 14, 2011. ^ "1999 World Series – New York Yankees over Atlanta Braves (4-0)". Baseball-Reference.com. Retrieved September 20, 2013. ^ Olney, Buster (April 19, 2000). "BASEBALL; Assured of His Role, Posada Seizes the Moment". The New York Times. Retrieved November 14, 2011. ^ "2000 World Series – New York Yankees over New York Mets (4-1)". Baseball-Reference.com. Retrieved September 20, 2013. ^ "Star-News". Google.com. Retrieved August 22, 2015 – via Google News Archive Search. ^ The New York Times (July 4, 2001). "The 2001 All-Star Rosters". Retrieved March 3, 2017 – via NYTimes.com. ^ "July 10, 2001 All-Star Game Play-By-Play and Box Score – Baseball-Reference.com". Retrieved August 22, 2015. ^ a b c McDonnell, Wayne G. (January 25, 2012). "Jorge Posada Spurns Nomadic Lifestyle Of An Aging Superstar". Forbes. Retrieved September 26, 2013. ^ "2001 World Series – Arizona Diamondbacks over New York Yankees (4-3)". Baseball-Reference.com. Retrieved September 20, 2013. ^ "Kentucky New Era". google.com. Retrieved August 22, 2015 – via Google News Archive Search. ^ "Silver Slugger awards announced". USA Today. November 5, 2002. Retrieved September 20, 2013. ^ "2003 World Series – Florida Marlins over New York Yankees (4-2)". Baseball-Reference.com. Retrieved September 20, 2013. ^ Feinsand, Mark (October 29, 2003). "Posada nabs another Silver Slugger". MLB.com. Retrieved September 20, 2013. ^ "2004 League Division Series – New York Yankees over Minnesota Twins (3-1)". Baseball-Reference.com. Retrieved September 26, 2013. ^ "2004 League Championship Series – Boston Red Sox over New York Yankees (4-3)". Baseball-Reference.com. Retrieved September 26, 2013. ^ "2005 League Division Series – Los Angeles Angels of Anaheim over New York Yankees (3-2)". Baseball-Reference.com. Retrieved September 20, 2013. ^ "Major League Leaderboards: 2006 Batters Win Probability Statistics". Fangraphs. Retrieved March 17, 2009. ^ Kepner, Tyler (May 17, 2006). "Posada Ends a Long Night With a Long Ball – New York Times". The New Yotk Times. Retrieved January 13, 2012. ^ "Jorge Posada: From 1995 to 2011, sorted by greatest wpa_bat: Results". Baseball-Reference.com. Retrieved January 13, 2012. ^ Kepner, Tyler (November 20, 2007). "Rodriguez Is M.V.P. ; Rivera Says He'll Re-Sign". The New York Times. 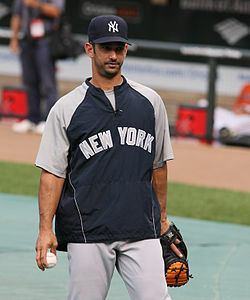 ^ "Yankees' Jorge Posada going on DL with sore shoulder". NJ.com. Retrieved August 22, 2015. ^ Hale, Mark (August 15, 2011). "Posada loves Yankees fans, but would consider playing for new team". New York Post. Retrieved October 17, 2011. ^ Feinsand, Mark; Madden, Bill (November 12, 2007). "Jorge Posada to stay with Yankees". New York Daily News. Retrieved March 17, 2009. ^ "Yanks give 36-year-old Posada $52.4M, four-year deal". ESPN.com. November 23, 2007. Retrieved November 23, 2007. ^ "Home - ACES Baseball Agency : Sam Levinson and Seth Levinson". AcesIncBaseball.com. Retrieved March 3, 2017. ^ Kepner, Tyler (July 21, 2008). "Posada Could Be Out for the Season". The New York Times. Bats blog. Retrieved December 7, 2010. ^ Kepner, Tyler (January 8, 2012). "Posada Stays True to Himself, and Loyal to the Yankees". The New York Times. ^ "N.Y. Yankees' acquisition of Xavier Nady could allow Jorge Posada to have surgery now". The Star Ledger. July 26, 2008. Retrieved December 7, 2010. ^ Botte, Peter (July 28, 2008). "Jorge Posada to have shoulder surgery, will need six months to rehab". New York Daily News. Retrieved March 17, 2009. ^ Ottawa, The (July 29, 2008). "Season's over for Posada". Canada.com. Archived from the original on October 21, 2013. Retrieved September 26, 2013. ^ McCarron, Anthony (April 16, 2009). "Jorge Posada swats historic first homer at Yankee Stadium, but day is no blast". New York Daily News. Retrieved December 7, 2010. ^ "Jorge Posada, Jesse Carlson suspended for brawl – ESPN". Sports.espn.go.com. September 17, 2009. Retrieved September 26, 2013. ^ Hoch, Bryan (November 4, 2009). "Six games, five rings, four Yankees". MLB.com. Retrieved September 12, 2010. ^ Kaplan, Thomas (June 13, 2010). "Posada Hits Another Slam in His Return to Catching". The New York Times. Retrieved December 7, 2010. ^ Blogging the Bombers (July 23, 2010). "Jorge Posada passes 1,000 RBIs, A. J. Burnett gets win as New York Yankees top Royals, 7–1". New York Daily News. Retrieved December 7, 2010. ^ "2010 League Championship Series – Texas Rangers over New York Yankees (4-2)". Baseball-Reference.com. Retrieved September 20, 2013. ^ a b Schmidt, Michael S. (November 10, 2010). "Yankees Catcher Jorge Posada to Have Knee Surgery". The New York Times. Retrieved December 7, 2010. ^ Feinsand, Mark (November 5, 2010). "Jesús Montero will get chance to win starting catching job, Jorge Posada will slide in as Yankees DH". New York Daily News. Retrieved November 7, 2010. ^ Harper, John (March 6, 2011). "Yankees DH Jorge Posada handling transition from catcher to full-time designated hitter with class". New York Daily News. Retrieved October 17, 2011. ^ Feinsand, Mark (December 16, 2010). "Yankees sign Russell Martin to $4M deal, Brian Cashman says he – not Jorge Posada – will be starter". New York Daily News. Retrieved October 17, 2011. ^ Marchand, Andrew (May 15, 2011). "Jorge Posada removes self from lineup". ESPNNewYork.com. ESPN. Retrieved May 16, 2011. ^ Marchand, Andrew; Begley, Ian (May 16, 2011). "Jorge Posada apologizes after spat". ESPNNewYork.com. ESPN. Retrieved May 16, 2011. ^ Bradley, Jeff (July 14, 2011). "Yankees' Jorge Posada may soon face more bad news". The Star-Ledger. Retrieved October 17, 2011. ^ "Joe Girardi benches Jorge Posada". ESPN.com. ESPN. August 7, 2011. Retrieved August 7, 2011. ^ Begley, Ian (January 2, 2010). "Posada proves bat still packs punch – Yankees Blog – ESPN New York". Espn.go.com. Retrieved October 17, 2011. ^ Caldwell, Dave (August 25, 2011). "Three Grand Slams Erase a Poor Start in Record Fashion". New York Times. Retrieved August 26, 2011. ^ a b Mike Mazzeo (November 9, 2011). "Jorge Posada says return to New York Yankees is 'not gonna happen'". Espn.com. Retrieved March 3, 2017. ^ a b c Keh, Andrew (October 7, 2011). "Posada Emotional After Loss". The New York Times. Retrieved October 27, 2011. 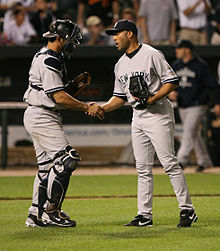 ^ "Jorge Posada, Yankees catcher, set to retire, will make formal announcement in coming weeks". New York: NY Daily News. Retrieved September 20, 2013. ^ "New York Yankees' Jorge Posada retires with underrated career – Tom Verducci – SI.com". Sports Illustrated. January 7, 2012. Retrieved September 20, 2013. ^ Nowak, Joey (January 24, 2012). "Emotional Posada retires after 17-year career". MLB.com. Retrieved January 24, 2012. ^ "Former Yankees catcher Jorge Posada: You won't catch me un-retiring". New York: NY Daily News. February 22, 2013. Retrieved September 20, 2013. ^ "Yankees to retire numbers of Pettitte, Posada and Williams". Yahoo!. February 16, 2015. Retrieved February 16, 2015. ^ Curry, Jack (October 19, 1998). "1998 WORLD SERIES: YANKEES VS. PADRES; Posada Bound to Hernandez by Trust". The New York Times. Retrieved November 14, 2011. ^ "Leo Posada". Baseball-Reference.com. Retrieved September 27, 2011. ^ a b "Stepping Up to the Plate". Livingneworleans.com. Retrieved August 8, 2012. ^ Jack Curry (September 12, 2009). "Even in Class A, Posada and Pettitte Sensed What Was to Come With Jeter". The New York Times. Retrieved February 11, 2010. ^ DiComo, Anthony (May 16, 2008). "Mets, Yanks join charity wine effort". MLB.com. Retrieved August 18, 2009. ^ "Posada misses game after son's surgery". MLB.com. June 8, 2011. Retrieved October 17, 2011. ^ "NY Yankee Jorge Posada recounts son's birth defect – books – Biography Memoirs – TODAY.com". Today.msnbc.msn.com. August 30, 2010. Retrieved January 13, 2012. ^ "Jorge Posada lost millions in 'jaw-dropping' fraud: lawsuit – New York Post". New York Post. Retrieved August 22, 2015. ^ Call, Andy (September 21, 2017). "Molina, wife raise money for Puerto Rico". MLB.com. Retrieved September 21, 2017. This page was last edited on 23 February 2019, at 01:23 (UTC).